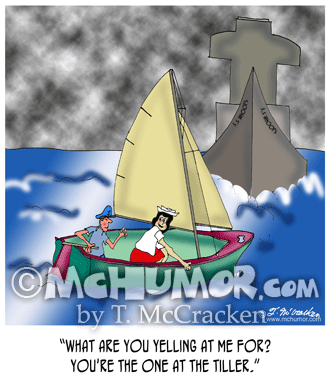 Pirate Cartoon 7458: A pirate captain yelling, "Bring me the sail maker!" 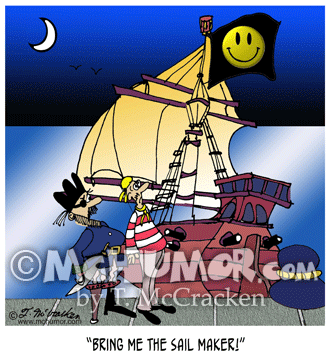 after a smiley-faced flag is raised on his ship. 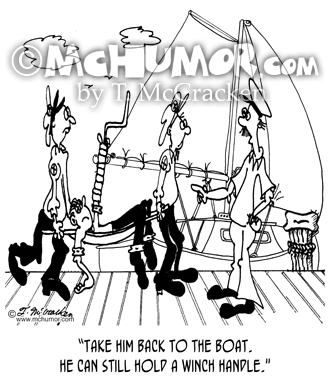 Sailing Cartoon 7457: When a sailor is carried away on a stretcher with a handle bandaged to his erect arm someone says, "Take him back to the boat. He can still hold a winch handle." 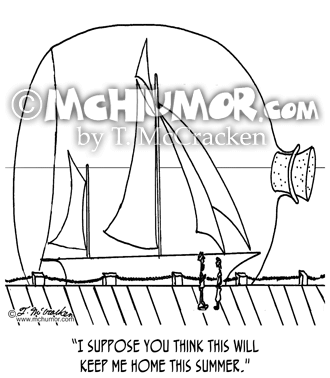 Sailing Cartoon 0427: As a battle ship is about to plow into a sail boat a crew member yells, "What are you yelling at me for? You're the one at the tiller." 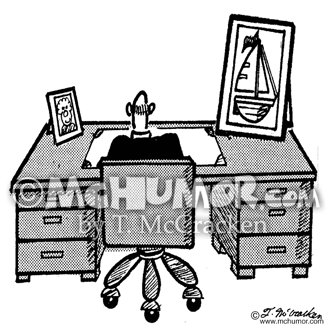 Sailing Cartoon 2128: An executive with photo of both his wife and his sailboat on his desk. Sailing Cartoon 0352: Of a humongous boat in a humongous bottle a man says to his wife, "I suppose you think this will keep me home this summer." 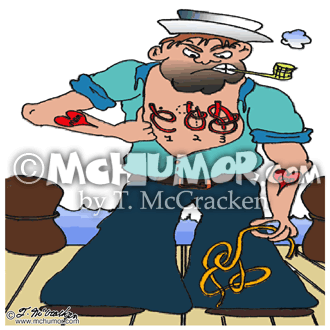 Sailing Cartoon 0411: An old salt with the directions for tying knots tattooed on his chest. 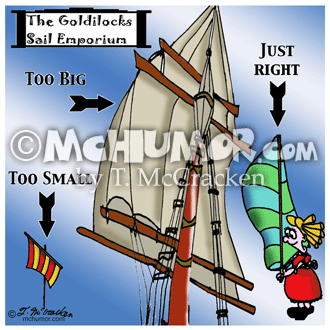 Sailing Cartoon 7511: At the Goldilocks Sail Emporium are sails labeled as "Too Big," "Too Small," and "Just Right." 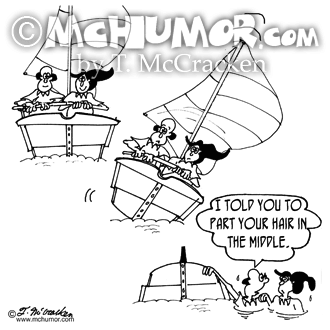 Sailing Cartoon 7510: A boat topples over with a woman in it with very lopsided hair, "I told you to part your hair in the middle." 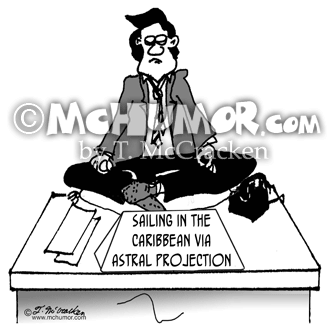 Sailing Cartoon 7509: Someone with a blank expression with a sign on their desk, "Sailing in the Caribbean Via Astral Projection." 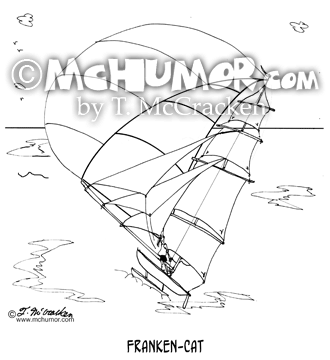 Catamaran Cartoon 7459: “Franken-Cat." A tiny catamaran with the huge sails of a clipper ship.